Why bother with employee engagement? Sometimes a question is so big, it's nice to break it down into a single, simple example rather than try for the 'big picture approach'. Hence the reason for this blog. 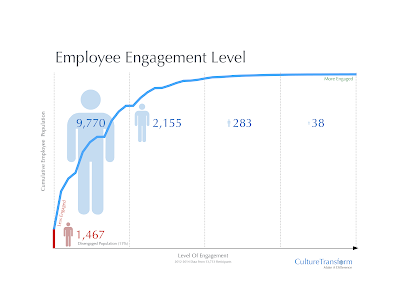 I've had the opportunity to work with an employee population over a number of years and see what effect engagement has in a number of different areas - one of which is staff turnover. 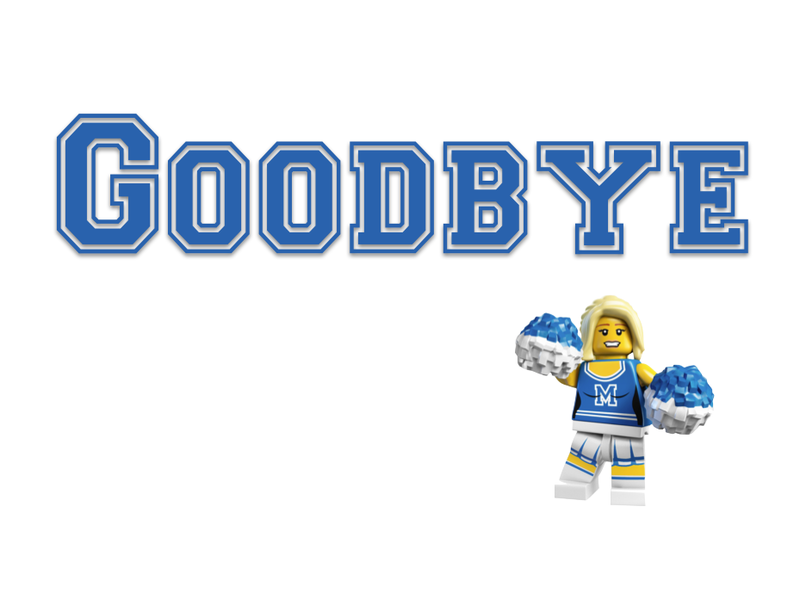 Conventional wisdom says that the more engaged a person is within a company, then the less likely they are to leave, and whilst this is true, that's not the whole picture. What is also often omitted from these discussions is that some attrition is actually desirable within an organisation for a multitude of reasons beyond the scope of this particular blog. So let's take a first look at our population and break it down into some typical 'quartiles' - except in this case we're also going to break out the totally disengaged folks. Those that simply do not participate in any of the people metrics we can gather (and in this case sixteen different measures where used). 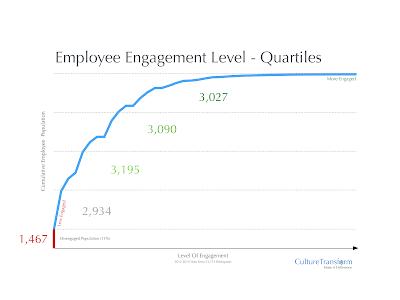 Without getting too geeky here, the chart below shows the number people in each engagement quartile - if you imagine a scale of 0 to 100, with the most engaged people scoring 100 - then there are on 38 people in the 75-100 band and 9,770 in the lower 25. This may come as a surprise to some, but it's a fairly typical pattern. The 38 at the top of this distribution are the 'superstars' of engagement, the culture ambassadors, brand fanatics, cheerleaders and motivators that exist in all organisations and have huge impact on morale (you may know one or two in your company). Typically, between 5-15% of any organisation are disengaged. They are the people who will tell you (should you ask) that they simply want to come into work and do their job, they don't want their contribution to exceed their role, or gain promotion. This should never be read as a 'happiness' indicator, but accepting that they cannot be more engaged is an unacceptable conclusion. The challenge is in the amount of effort that is needed. For the sake of statistical stability, and to take some of the 'emotional' interpretation out of this - we'll divide up our population in four (almost) equal quartiles, while keeping our disengaged population separate - and see what happens to each of these groups over two years. 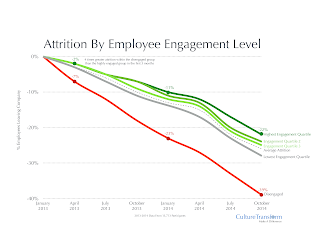 By the end of year one, the disengaged group attrition is approximately double that of the rest of the employee population, and after two years that pattern is consistent. 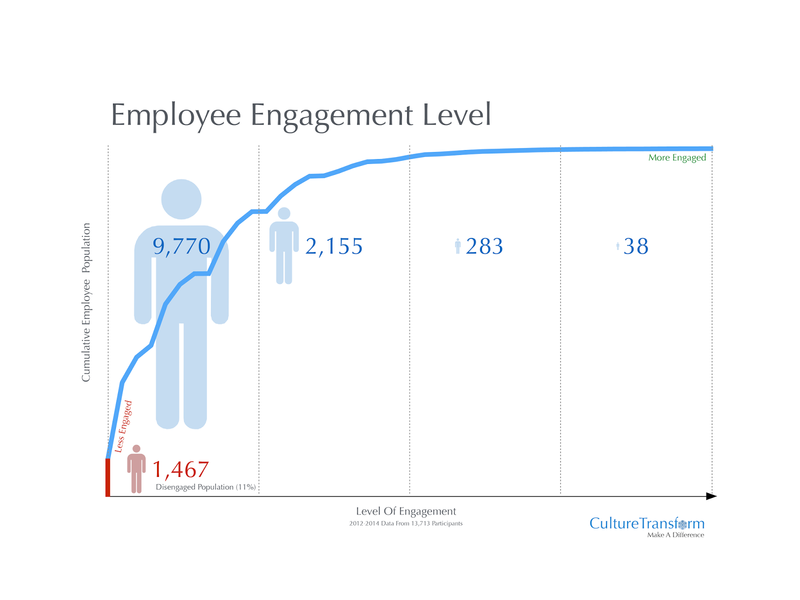 The chart clearly shows that the more engaged people are, the less likely they are to leave the company - but the significant finding is that even the smallest amount of engagement is enough to halve the attrition rate. Let's try and quantify this - there are a number of studies that analyse the cost of employees leaving, and the associated recruitment costs. I'm going to use this one by Oxford Economics, published in HR Review last year. It takes into account cost of lost output and recruitment costs and calculates a cost of £30,614 per employee. There are many less conservative estimates which place recruitment costs at between 30-50% of salary, but let's think about that for a moment. Not paying attention to employee engagement? Maybe it's time to start. Geek Note: The relationship between engagement and attrition shows a strong negative Pearson correlation coefficient of -0.61, Kendall's Tau of -0.75 and Spearman's Rho is -0.85. 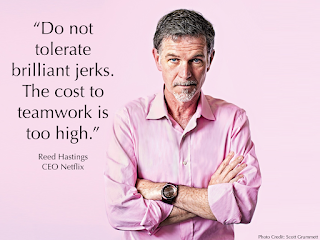 Can you place a monetary value on the strength of a corporate culture? Is there any way to prove the value of employing people that fit? 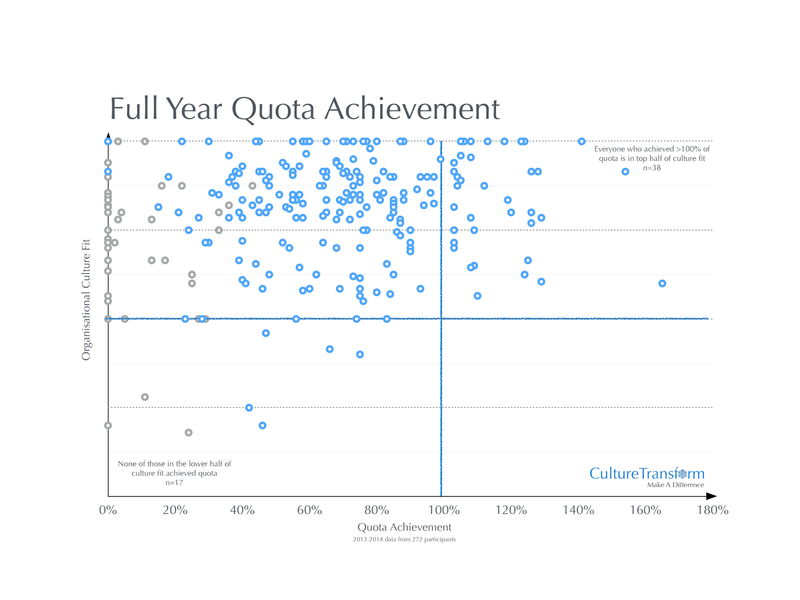 I recently had the opportunity to look at a group of sales people and see if their culture fit predicted quota achievement for the year. This is an effective test that relies on some 'hard' data from the finance folks, and some 'softer' data from the HR team. A positive correlation proves that people who align more closely with the organisation they are part of will perform better, especially in high pressure situations. Below are illustrations from two sets of data, one taken at mid-year, showing quota achievement against the culture fit of the individuals in question. The second one shows full year results. 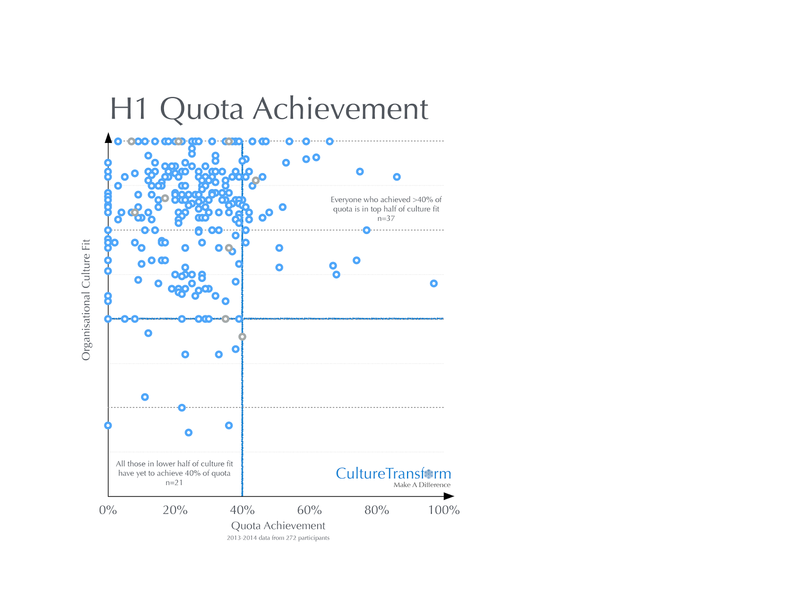 The first chart shows a group of 37 sales people making a flying start - everyone over 40% of their quota lies in the top half of organisational culture fit, while not a single person from the bottom half is doing well. 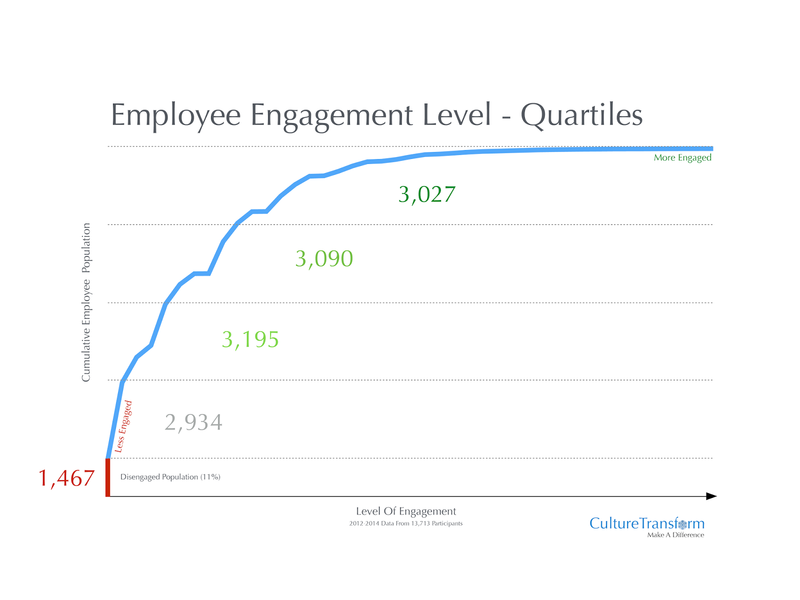 The second chart shows the full picture for the year, again illustrating that those in the top half of the organisational culture spectrum are outperforming those in the bottom. In this case 38 people achieved more than 100% of their designated quota, while not a single individual in the lower half made their target. Note that the actual financial rewards are not shown, these have to remain confidential - but over 30% of revenue came from that top right quadrant. Naturally hiring processes have changed at the company in question - who now place a great deal more emphasis on how potential employees fit with their culture and working practices. You may also notice that there are no 'brilliant jerks' in this analysis. No high flying sales person with a terrible culture fit. This is clearly a company that took Reed Hastings advice to heart. If you're paying really close attention, you may also notice the grey markers on the charts - these are people who left the organisation. In the first half of the year, these were generally at the higher end of culture fit with low to medium quota achievement, in the latter half they were predominantly the under-achievers (this is after all a sales organisation). Culture fit is no cast-iron guarantee of sales success, but the probability of better results increases when you find people that share common values, behaviours and aspirations with the rest of the organisation. Defining that fit and working it into the interview process is critical - as is ensuring you can truly define what your culture looks like today. Why not take some time do this analysis on a sales team in your company and see if you find similar results? It's a great way for HR teams to contribute directly to revenue improvement.